The first Damen Tower (originally called Robey Tower, for Damen Avenue's original name) was built in 1895 to control the interlocked junction where the Metropolitan West Side Elevated's Northwest branch split into the Logan Square branch (continuing northwest to Logan Square at Kedzie/Logan Blvd.) and the Humboldt Park branch (heading due west to Lawndale Terminal, a half block north of North Avenue). The original Damen Tower was north of North Avenue, on the east side of the right-of-way, immediately adjacent to the junction where the branch split. The tower was a two-story structure at track level, clad in metal siding and toped with a hipped roof. The original interlocking was a 16-lever mechanical plant installed at the time the Humboldt branch was built. It is unknown if the mechanical lever plant was ever replaced with a more advanced interlocking technology, although it is possible the lever-controlled plant remained in use through the end of Humboldt Park service. The remainder of the tower's service life was relatively unremarkable. 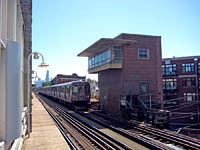 Although it was intended to replace Damen Tower with a newer facility located south of the junction (see below), this did not occur as planned and the original Damen Tower remained in service until the end of Humboldt Park service in 1952. In 1948, it was decided that the practice of adding and cutting Humboldt cars from Logan Square trains at Damen was causing delays and other problems, especially with outbound passengers ending up in the wrong part of the train. So on August 29, 1948, off-peak Humboldt Park service was cut to a Lawndale-Damen shuttle. 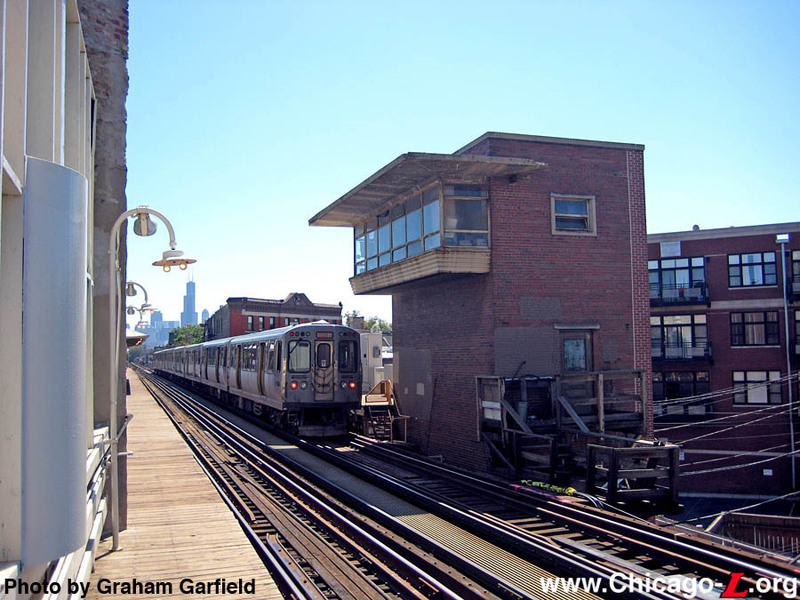 The Humboldt car would arrive just before a Loop-bound Logan Square train, discharge at the inbound Damen platform and pick up Humboldt Park-bound passengers, and cross over to the northbound track just north of the station to return to the branch. (During rush hours, the practice of Humboldt Park trains running directly downtown remained unchanged, although now all Logan trains would serve the Loop and all Humboldt trains would terminate at the Wells Street Terminal.) This move was presumably controlled by Damen Tower, as it occurred at the interlocked right-hand crossover immediately south of the junction. For over a year beginning on February 25, 1951, the tower had not been used in daily Humboldt Park service, since service on the branch was reduced at that time to a shuttle which terminated at a special platform on the branch, west of the junction, negating the need for trains to come through the junction and enter Damen station proper. Still, the junction continued to be used for car moves, and continued to be controlled from Damen Tower. Service on the Humboldt Park branch was discontinued on May 4, 1952. The Humboldt Park branch was abandoned as part of a larger effort on the part of the CTA rationalize the system and make it more economical by better coordinating the surface and rapid transit systems and shedding low-ridership routes. The decision to cease service on the branch was as much a function of CTA needing to meet their fiduciary obligations to their bond-holders as it was to make the system more efficient. After Humboldt Park service was discontinued, the section of the branch west of Oakley was scrapped very quickly, but a three block stub between Damen Junction and Oakley Avenue remained for several years. The junction's interlocking also remain in service (though probably rarely used) for a few years before being removed from service on August 3, 1954. 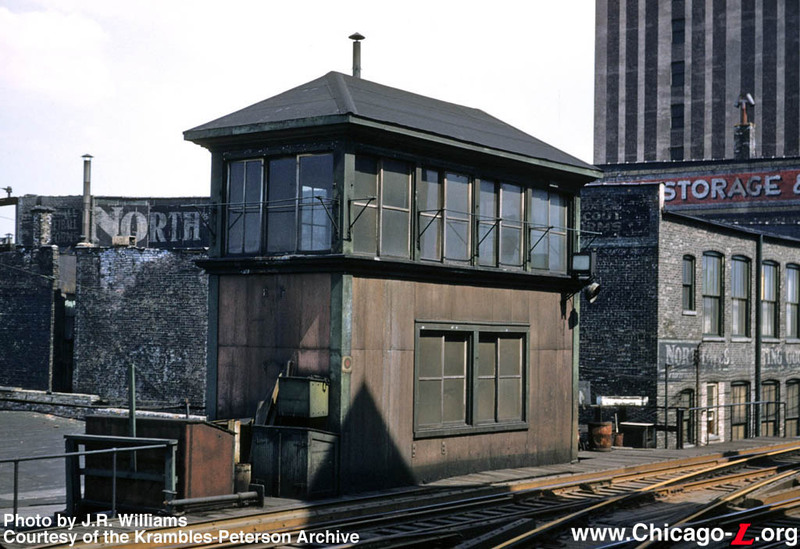 The old tower was likely demolished soon after, although the actual demolition date of the building is unknown; it is only assumed that it continued to control the largely-unused switches at Damen Junction between 1952 and 1954. The switches at Damen Junction connecting to the stub track remnant of the former branch were replaced with hand-throw switches. 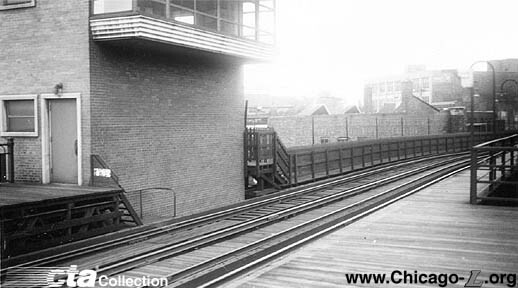 The junction and the short section of track were finally removed in the late 1960s. Although the story of Damen Tower might have ended there, as did the history of many other towers that controlled branches and interlockings abandoned in the early days of the CTA, this location has an interesting later history that is, in many ways, a look at "what might have been." The 1895-built Damen Tower was to be replaced with a new Damen Tower, and indeed the new Damen Tower was built and stands today... but was never used as a tower. During the planning for the Initial System of Subways in the 1940s, the intent of constructing the Milwaukee-Dearborn Subway wasn't to replace the portion of the Northwest Branch along Paulina Street (what was later referred to as the "Paulina Connector" after the Dearborn Subway opened) but to supplement it. Although the purpose of the Milwaukee-Dearborn Subway was to provide a more direct route for trains from the Northwest Side to Downtown, the City intended to continue using the old Paulina trackage. Indeed, in later stages of the Comprehensive Plan for the Extension of the Subway System, plans called for building a line roughly parallel to Paulina or Ashland north from Milwaukee to meet the Ravenswood branch, and south along the same alignment between 21st Street on the Douglas branch and Ashland/79th, in essence creating a crosstown line via the Paulina Connector. Aside from these grander, long-term plans, circa 1946 (before the CTA assumed operation of the system), there was a more immediate concept to operate half of the Logan Square trains over the old elevated alignment via Paulina and the Met main line (to the Loop or to Wells Street Terminal) and operate half via the subway, and likewise to operate half of the Humboldt Park trains over the elevated and half via the subway. So, in the pre-CTA planning of the expansion of the city's rapid transit network, both the Humboldt Park branch and the Paulina Connector were assumed to have a future. To that end, the plans for the Milwaukee-Dearborn Subway included a new tower to replace the old Damen Tower. Designed at roughly the same time as Armitage and 17th towers on the State Street Subway, for very similar purposes (i.e. to control junctions where the new subways connected to existing elevated lines) and looking very similar in design to those two towers, the new Damen Tower was not actually situated at Damen Junction. 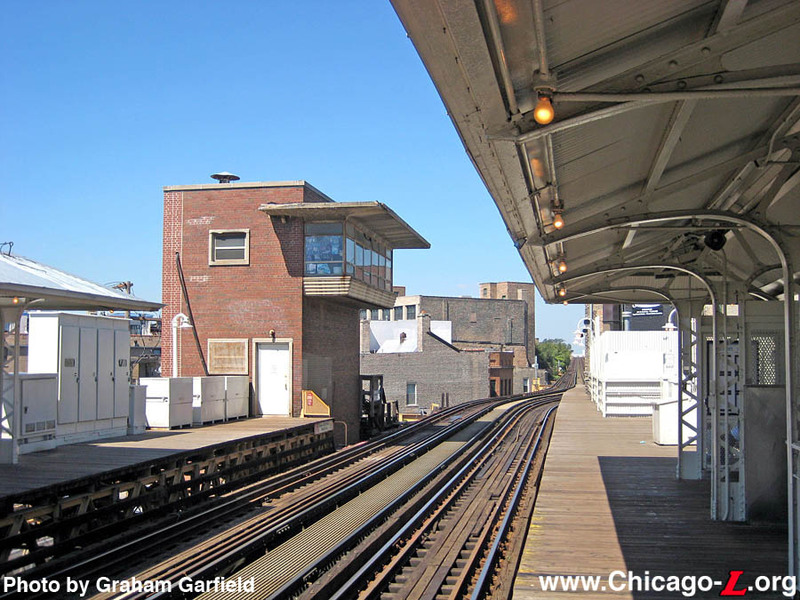 Instead, the tower was located about a block south, on the south side of North Avenue, immediately north and adjacent to the north end of the southbound platform of Damen station. 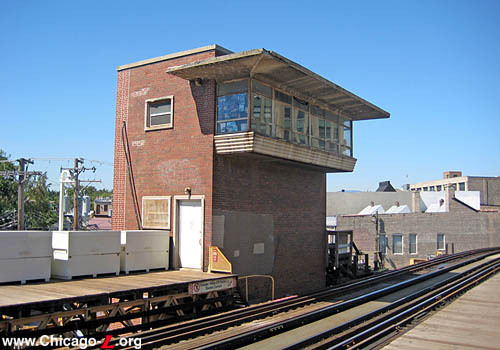 The plan was to have the new tower control both Damen Junction and Evergreen Junction (where the new subway met the existing Northwest branch elevated where it curved south from being parallel to Milwaukee Avenue to being parallel to Paulina Street). By situating the new tower between the two junctions, the towerman could have a view of both locations, aiding in his simultaneous control of both interlocking plants. After the CTA took over and began to prune and reorganize the rail system, they had other plans for the Humboldt Park branch and how to route trains via the Milwaukee-Dearborn Subway versus the old Northwest branch along Paulina. 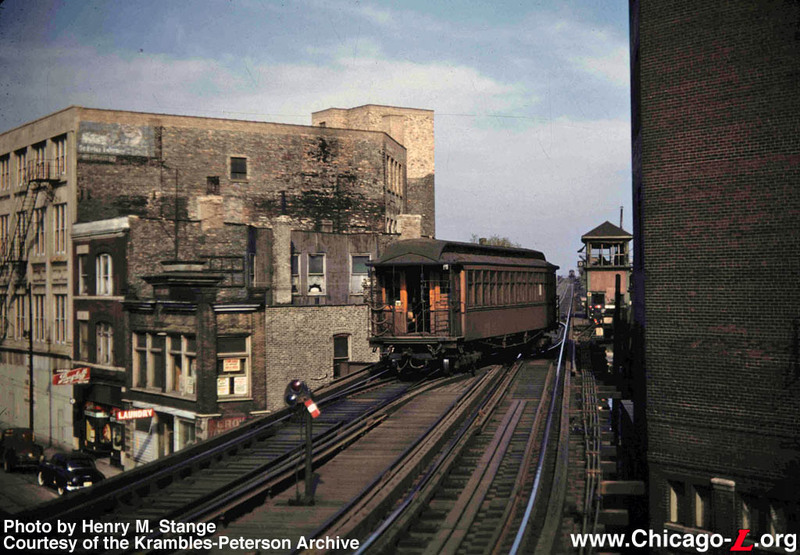 In 1948, Humboldt service was reduced off-peak to a shuttle connecting to through-service to downtown at Damen, signaling the first indication that CTA did not have long-term plans for the service. 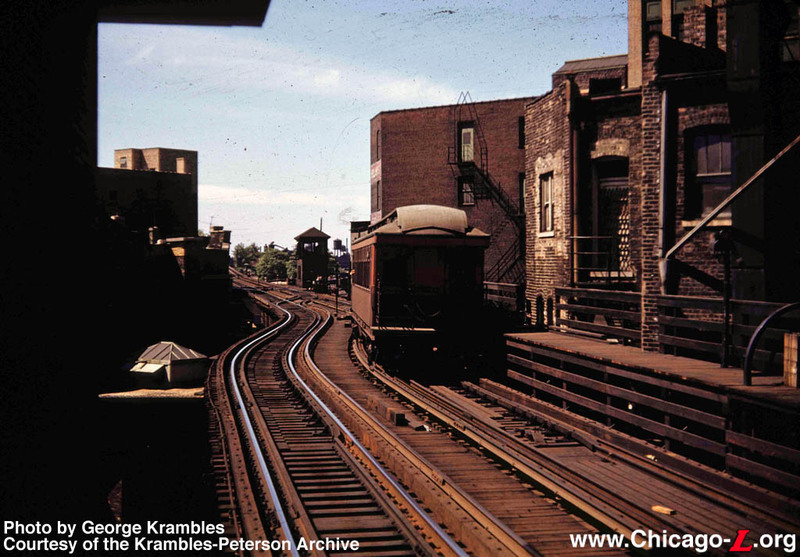 And when the subway opened in 1951, all Humboldt service was reduced to a Lawndale-Damen shuttle. Only trains from Logan Square used the new subway, leaving no trains using the old elevated connection via Paulina. 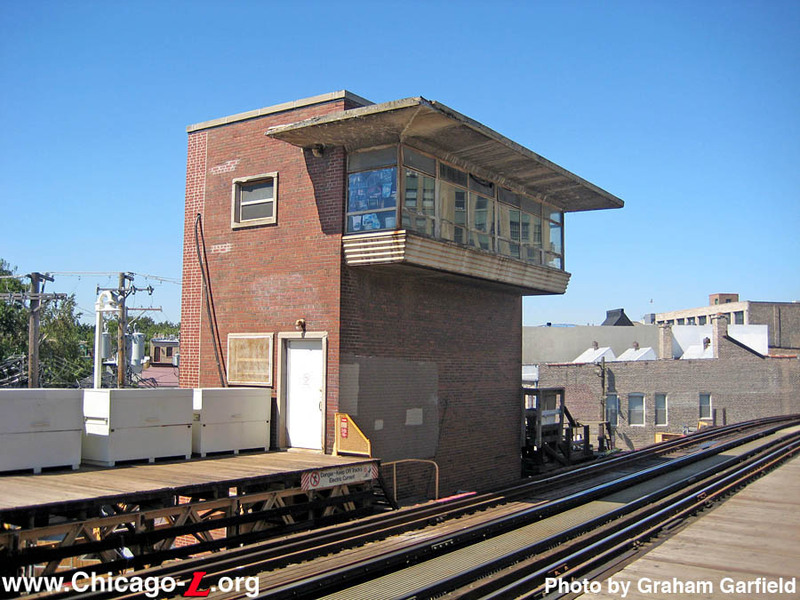 Although the structure of the new tower was still built, there was evidently enough time to cancel (or never place the order for) the interlocking equipment and tower panel that would've been needed to equip and control the planned interlockings at Damen and Evergreen. So, while the structure of the new Damen Tower was built, it was never equipped or functioned as a tower -- it never had an tower panel or any of the associated gear or infrastructure. It did, however, house an air compressor for powering the track trips at the wayside signals in the Milwaukee-Dearborn Subway. That compressor charged an air line which was tapped at each signal for an air motor that moved the track trip. 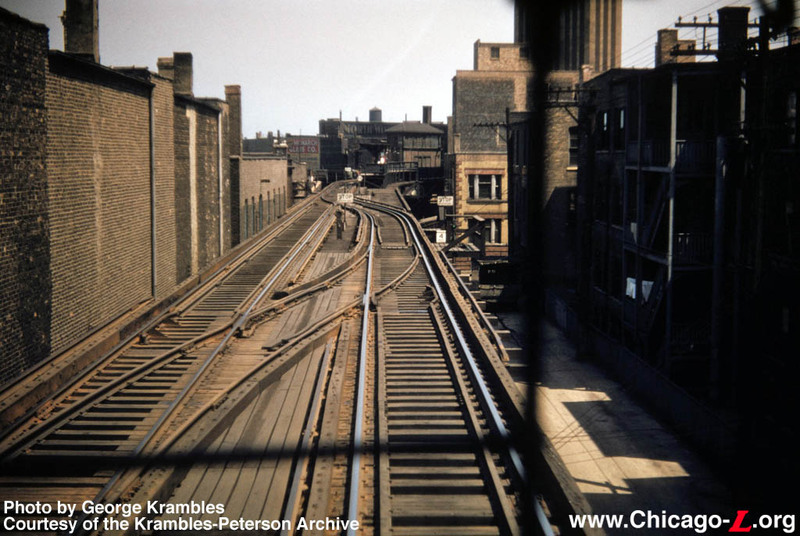 The air line was extended north of Damen to cover the new block signaling on the Milwaukee Elevated all the way to Logan Square in 1960, and trips of those signals were fed from the compressor at Damen Tower as well. 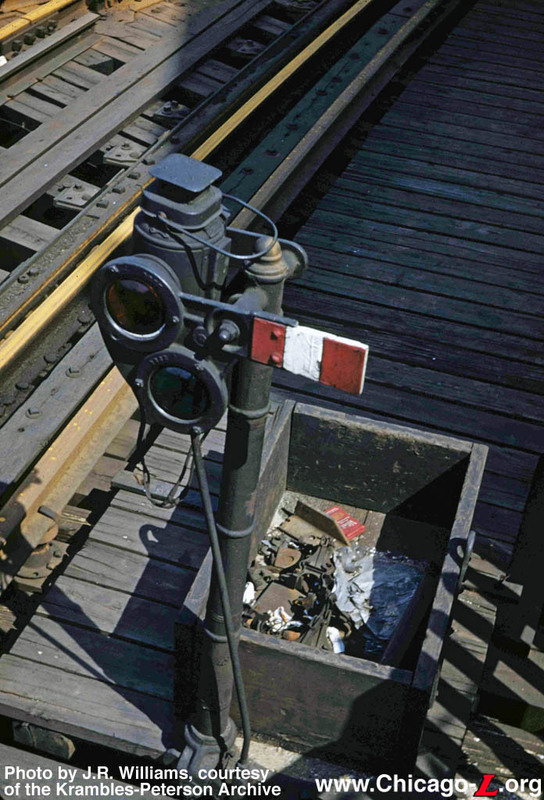 The signals on the Milwaukee Elevated was the last of the air-operated trip installations (interestingly, occurring later than the installation circa 1959 of electrically operated trips accompanying the new block signals on the eastern part of the Congress branch). The tower is roughly four stories high, stretching from street level to (what was intended to be) a control room cantilevered over the tracks. Access is provided to the tower building from both street-level and platform-level. The tower is faced in brick, unlike the cast concrete towers built at Armitage and 17th, which were also part of the Initial System of Subways buildout but designed a bit earlier. The tower room on the top floor features large picture windows on three sides for visibility north and south down the tracks, intended to provide the towerman a vista to both Damen and Evergreen junctions. The cornice of the tower and the broad eave of the cantilevered control room are built of case concrete, while the windows and lower exterior sill of the outcropping are made of metal. One interesting, indirect use of the new tower was as a pass-through for passengers walking to the Humboldt shuttle platform between February 1951 and May 1952. With Humboldt trains no longer discharging directly onto the inbound platform at Damen and instead using a new platform built on the branch itself, just west of the junction, a long track-level walkway led from the shuttle platform, along the tracks, through the Damen Tower, and onto the north end of the inbound Damen platform. 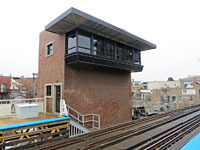 Passengers walked from the platform through a doorway on the south elevation of the tower (visible in the photo below), through the tower, out a door on the north elevation, and down a short set of stairs to the track-level walkway to get to the shuttle platform; riders did the reverse to transfer from the shuttles to the through-trains at Damen. After this brief use as part of the Humboldt shuttle walkway, the new tower building served little function other than housing the air compressor for the Milwaukee-Dearborn Subway and Milwaukee Elevated track trips. The Milwaukee Elevated block signals were replaced with all-electric automatic train control (ATC) signals north of Western in 1972, ending the use of the compressor for signals north Western at that time. The block signals in the Milwaukee-Dearborn Subway and on the Milwaukee Elevated south of Western were replaced with ATC signals as part of the Blue Line Signal Project in 2007-09. The last section of automatic block signal (ABS) in the subway was deactivated in April 2009, ending the need for the air compressor. 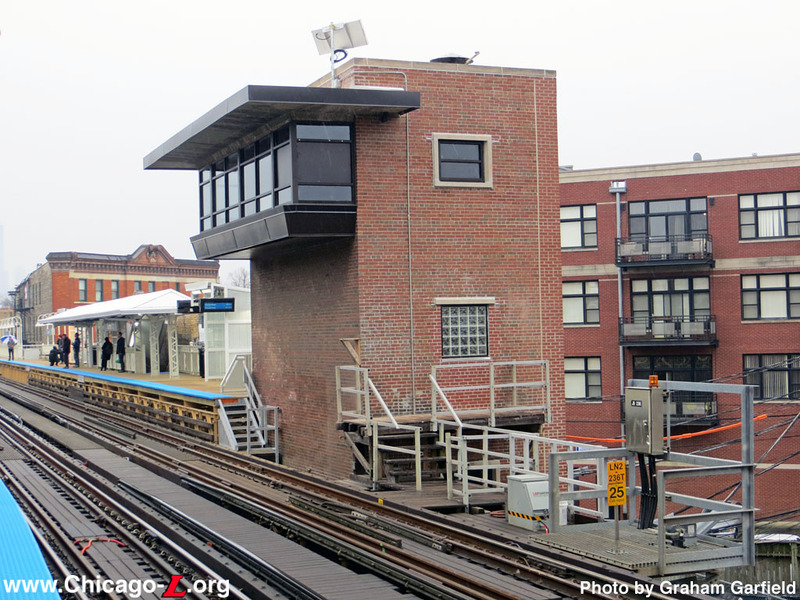 The only other use for the tower building over the years has been for office and work space for the CTA Signal Department. As part of the renovation of the Damen station in fall 2014, the tower building also received some improvements. The structure received new windows and doors, new cladding on the fascia under the windows and on the canopy on the projecting window bay, and cleaning and tuckpointing of the masonry. The door that was on the northwest face of the tower -- through which passengers walked on their way to the track-level walkway to the Humboldt Park branch shuttle platform between 1951 and 1954 -- visible in earlier photos, was removed in the renovation and replaced with a glazed block window, the space underneath filled in with bricks.